Thanks to recent County Council action, more affordable housing units may soon become available on Maui. The council authorized more than $11.7 million for affordable-housing projects by approving three budget amendments. The funding will facilitate development of the county’s 56-unit Kulamalu project Upcountry, a 12-lot development at Kahoma Village in Lahaina by Na Hale O Maui, and the 16-unit Kahawai condominium in Wailuku by Habitat for Humanity. The Budget and Finance Committee, which recommended approval of the funding, noted the projects are part of the county’s affordable housing fund annual plan. In addition, the council approved zoning and community plans for A&B Properties’ 600-unit “Kihei Residential Project,” which will be located on 94 acres mauka of Piilani Highway, south of the Mokulele Highway intersection. Pursuant to the county’s residential workforce housing policy, A&B will provide affordable units as part of the project, as well as single-family and multifamily units, along with a commercial center, park and open space. Upcoming council business includes the Budget and Finance Committee’s continued review of multiple offers of various parcels of land for sale to the county. After conducting site inspections and an initial meeting last month, the committee convenes at 9 a.m. Tuesday for further consideration of a land acquisition in Central Maui for a new county service center and other public purposes. The Economic Development, Energy, Agriculture and Recreation Committee meets Tuesday at 1:30 p.m. to consider an “Open Data” policy for Maui County, at my request. The committee will receive a presentation from Burt Lum, executive director of Hawaii Open Data. Lum is co-host of Hawaii Public Radio’s Bytemarks Cafe and recently assisted in the creation and implementation of open data policies for the State of Hawaii and the City and County of Honolulu. Open data is about making public information freely available online to all people to use and republish as they wish, without restrictions from copyright, patents or other controls. Besides increasing government transparency and accountability, open data allows individuals to use their creativity to develop applications – “apps” – and services that address public needs, such as Honolulu’s “DaBus” app, which gives real-time bus arrival information and tracks the current location of any bus in the system. The state’s open data portal is data.hawaii.gov. Should the county create a similar resource? Tweet your comments to @mauicounty. 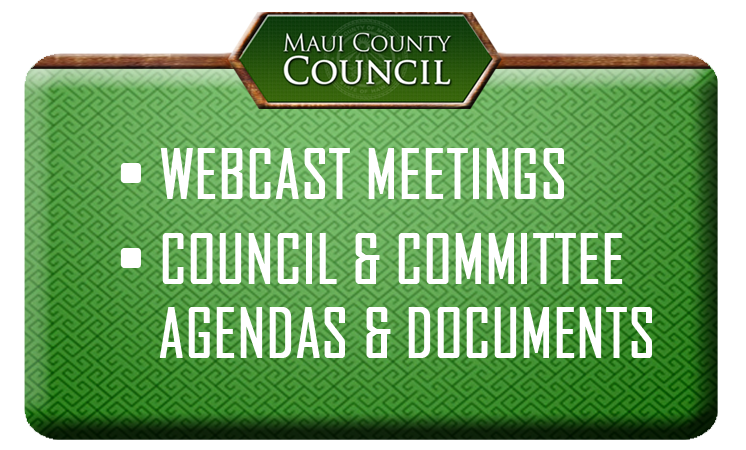 Sign up to receive meeting agendas – and civil defense notifications – via email or text at mauicounty.gov/list.aspx.